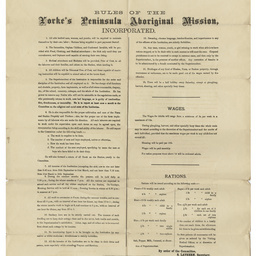 Poster 'Rules of the Yorke's Peninsula Aboriginal Mission Incorporated, 1892. In addition to the rules, it also list the wages paid and rations issued. Article from magazine 'Mission work in South Australia / by a Lady'. Not dated, pp175-190. Offprint on the 'Death of King Tommy', Ocober 1886. 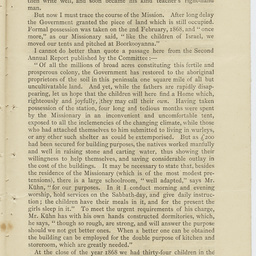 Newspaper articles on Point Pearce Mission, its inhabitants, and appeals by Mary A. Meredith on their behalf. 19 May 1866 and undated. Envelope in which the papers were stored. 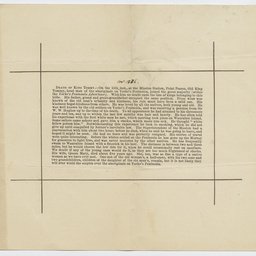 Records relating to 'Point Pearce Native Mission from Mrs Meredith', comprising letters, reports, lists of Aboriginal people, mainly Narungga [Narangga] living on the mission, Aboriginal names and words, 'Rules for the Yorke Peninsula Mission' and newspaper cuttings.A transcript to the correspondence has been created and may be requested. This collection depicts Australian Aboriginal people or aspects of their culture. SRG 94/W60/1/1: Letter to Mrs Meredith from the Bishop, 13 January 1866. 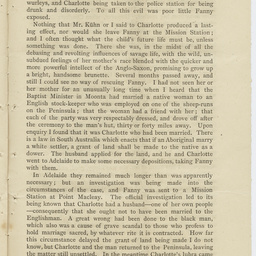 SRG 94/W60/1/2: Letter to Mrs Meredith from the Bishop, 13 January 1866. SRG 94/W60/1/3: Letter to Mrs Meredith from the Bishop, 13 January 1866. 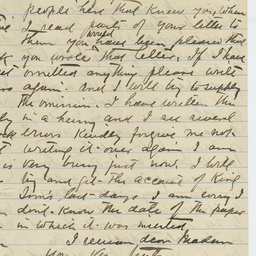 SRG 94/W60/1/4: Letter to Mrs Meredith from the Bishop, 13 January 1866. SRG 94/W60/2/1: Vocabulary and list of Aboriginal people living on the Mission, including out stations (not dated). SRG 94/W60/2/2: Vocabulary and list of Aboriginal people living on the Mission, including out stations (not dated). SRG 94/W60/3/1: List of 'Natives at Moonta March 25th 1866'. SRG 94/W60/3/2: List of 'Natives at Moonta March 25th 1866'. SRG 94/W60/4/1: Report, written from 'St Margaret's, Babbacombe. Nov 77'. Unsigned, includes newspaper cuttings. SRG 94/W60/4/2: Report, written from 'St Margaret's, Babbacombe. Nov 77'. Unsigned, includes newspaper cuttings. SRG 94/W60/4/3: Report, written from 'St Margaret's, Babbacombe. Nov 77'. Unsigned, includes newspaper cuttings. SRG 94/W60/4/4: Report, written from 'St Margaret's, Babbacombe. Nov 77'. Unsigned, includes newspaper cuttings. SRG 94/W60/4/5: Report, written from 'St Margaret's, Babbacombe. Nov 77'. Unsigned, includes newspaper cuttings. SRG 94/W60/4/6: Report, written from 'St Margaret's, Babbacombe. Nov 77'. Unsigned, includes newspaper cuttings. SRG 94/W60/4/7: Report, written from 'St Margaret's, Babbacombe. Nov 77'. Unsigned, includes newspaper cuttings. SRG 94/W60/5/1: Memo by E.K. 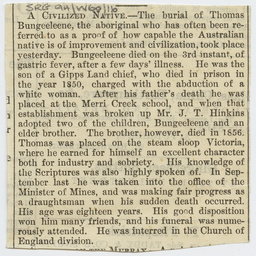 Hamilton from the Aborigines Office, Adelaide, 31st March 1885, reporting on a visit to the Point Pierce [sic] Mission. 3pp. SRG 94/W60/5/2: Memo by E.K. 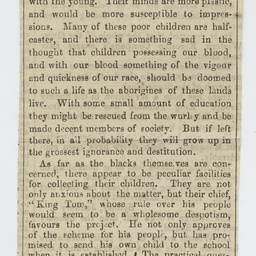 Hamilton from the Aborigines Office, Adelaide, 31st March 1885, reporting on a visit to the Point Pierce [sic] Mission. 3pp. SRG 94/W60/5/3: Memo by E.K. 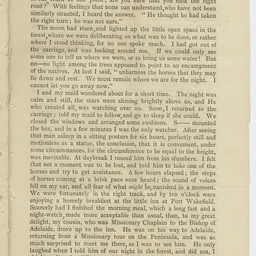 Hamilton from the Aborigines Office, Adelaide, 31st March 1885, reporting on a visit to the Point Pierce [sic] Mission. 3pp. SRG 94/W60/5/4: Memo by E.K. 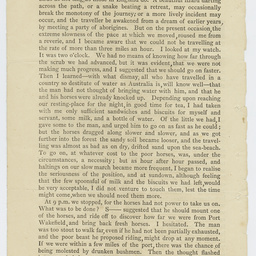 Hamilton from the Aborigines Office, Adelaide, 31st March 1885, reporting on a visit to the Point Pierce [sic] Mission. 3pp. SRG 94/W60/6/1: Supplement to the memo (item 5) describing the Mission, with annotation 'This information I have recd during the present year - 1892. Mary A. Meredith'. 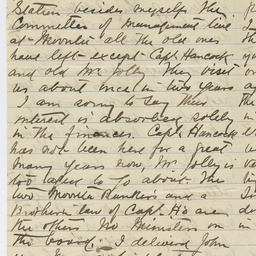 SRG 94/W60/6/2: Supplement to the memo (item 5) describing the Mission, with annotation 'This information I have recd during the present year - 1892. Mary A. Meredith'. SRG 94/W60/7/1: Letter written from Point Pearce Mission by Tho. M. Sutton, 11 August 1892 to unidentified man. SRG 94/W60/7/2: Letter written from Point Pearce Mission by Tho. M. Sutton, 11 August 1892 to unidentified man. SRG 94/W60/7/3: Letter written from Point Pearce Mission by Tho. M. Sutton, 11 August 1892 to unidentified man. SRG 94/W60/8/1: Letter written from Point Pearce Mission by Tho. M. Sutton, 12 November 1892 to unidentified woman. SRG 94/W60/8/2: Letter written from Point Pearce Mission by Tho. M. Sutton, 12 November 1892 to unidentified woman. SRG 94/W60/8/3: Letter written from Point Pearce Mission by Tho. M. Sutton, 12 November 1892 to unidentified woman. SRG 94/W60/8/4: Letter written from Point Pearce Mission by Tho. M. Sutton, 12 November 1892 to unidentified woman. SRG 94/W60/8/5: Letter written from Point Pearce Mission by Tho. M. Sutton, 12 November 1892 to unidentified woman. SRG 94/W60/8/6: Letter written from Point Pearce Mission by Tho. M. Sutton, 12 November 1892 to unidentified woman. SRG 94/W60/8/7: Letter written from Point Pearce Mission by Tho. M. Sutton, 12 November 1892 to unidentified woman. SRG 94/W60/8/8: Letter written from Point Pearce Mission by Tho. M. Sutton, 12 November 1892 to unidentified woman. SRG 94/W60/9: Poster 'Rules of the Yorke's Peninsula Aboriginal Mission Incorporated, 1892. In addition to the rules, it also list the wages paid and rations issued. SRG 94/W60/10/175: Article from magazine 'Mission work in South Australia / by a Lady'. Not dated, pp175-190. SRG 94/W60/10/176: Article from magazine 'Mission work in South Australia / by a Lady'. Not dated, pp175-190. SRG 94/W60/10/177: Article from magazine 'Mission work in South Australia / by a Lady'. Not dated, pp175-190. SRG 94/W60/10/178: Article from magazine 'Mission work in South Australia / by a Lady'. Not dated, pp175-190. SRG 94/W60/10/179: Article from magazine 'Mission work in South Australia / by a Lady'. Not dated, pp175-190. SRG 94/W60/10/180: Article from magazine 'Mission work in South Australia / by a Lady'. Not dated, pp175-190. 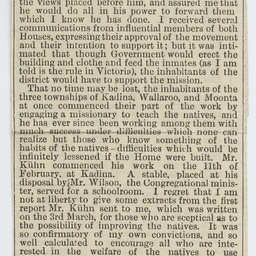 SRG 94/W60/10/181: Article from magazine 'Mission work in South Australia / by a Lady'. Not dated, pp175-190. SRG 94/W60/10/182: Article from magazine 'Mission work in South Australia / by a Lady'. Not dated, pp175-190. 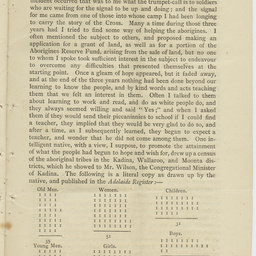 SRG 94/W60/10/183: Article from magazine 'Mission work in South Australia / by a Lady'. Not dated, pp175-190. 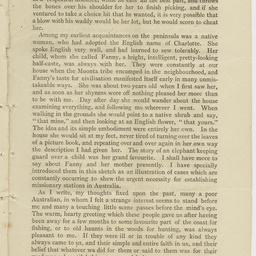 SRG 94/W60/10/184: Article from magazine 'Mission work in South Australia / by a Lady'. Not dated, pp175-190. SRG 94/W60/10/185: Article from magazine 'Mission work in South Australia / by a Lady'. Not dated, pp175-190. 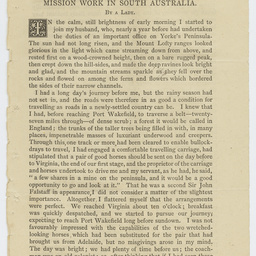 SRG 94/W60/10/186: Article from magazine 'Mission work in South Australia / by a Lady'. Not dated, pp175-190. 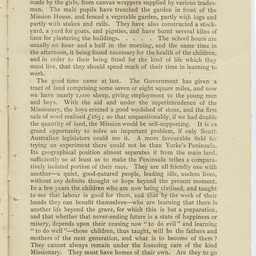 SRG 94/W60/10/187: Article from magazine 'Mission work in South Australia / by a Lady'. Not dated, pp175-190. 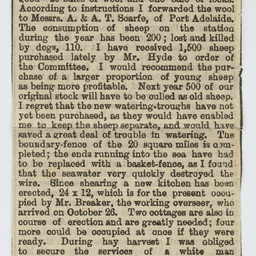 SRG 94/W60/10/188: Article from magazine 'Mission work in South Australia / by a Lady'. Not dated, pp175-190. 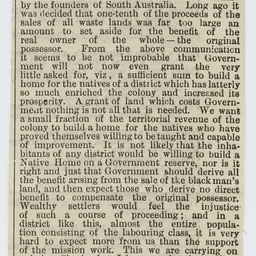 SRG 94/W60/10/189: Article from magazine 'Mission work in South Australia / by a Lady'. Not dated, pp175-190. 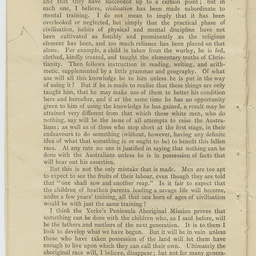 SRG 94/W60/10/190: Article from magazine 'Mission work in South Australia / by a Lady'. Not dated, pp175-190. SRG 94/W60/11: Offprint on the 'Death of King Tommy', Ocober 1886. 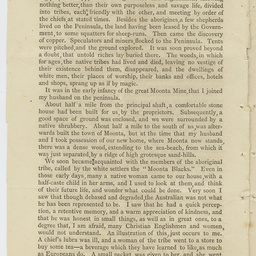 SRG 94/W60/12: Newspaper articles on Point Pearce Mission, its inhabitants, and appeals by Mary A. Meredith on their behalf. 19 May 1866 and undated. SRG 94/W60/13: Newspaper articles on Point Pearce Mission, its inhabitants, and appeals by Mary A. Meredith on their behalf. 19 May 1866 and undated. SRG 94/W60/14: Newspaper articles on Point Pearce Mission, its inhabitants, and appeals by Mary A. Meredith on their behalf. 19 May 1866 and undated. SRG 94/W60/15: Newspaper articles on Point Pearce Mission, its inhabitants, and appeals by Mary A. Meredith on their behalf. 19 May 1866 and undated. SRG 94/W60/16: Newspaper articles on Point Pearce Mission, its inhabitants, and appeals by Mary A. Meredith on their behalf. 19 May 1866 and undated. 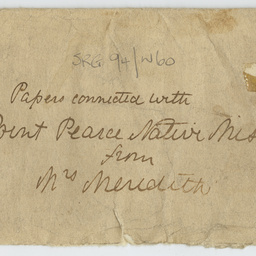 SRG 94/W60/17: Envelope in which the papers were stored.